This is an update to our post last week regarding Amazon’s Incentivized Review TOS Update. Many of you might feel uncertain or confused now that sellers can no longer require shoppers to provide reviews in exchange for free/discounted products. I’m with you. This past week has been a crazy town. Others might see danger, but there is a big opportunity here for you to make your move. Let’s talk about Concerts, Cake and Christmas. We were all enjoying sweet music and dancing to a rhythm until Amazon’s negative PR came marching in with clashing cymbals last week. 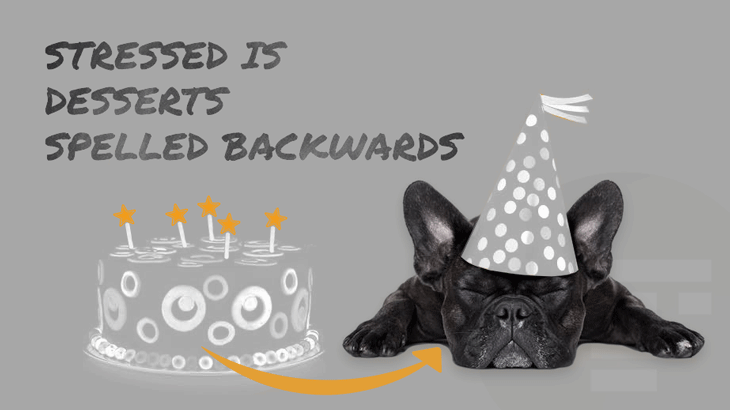 Tomoson’s team pulled some late nighters and updated the platform to be in full compliance with Amazon’s new policy within 48 hours. You might not feel in harmony with the new changes quite yet, but this is still the same song. We all just need to figure out how to play some different instruments. I like cake better than instruments though, so let’s talk about that. Reviews in exchange for free products have always been the cherry on top of the cake, a bonus if you will. But there are more layers of goodness and value to this red velvet cake wrapped in white chocolate cream cheese icing. Here’s how to get the most value from Tomoson. Although you can still ask for reviews for non-Amazon products in Tomoson’s system, Amazon reviews can no longer be required. Why? We know the obvious. Amazon updated their TOS. But seriously. Why did Amazon do this? All of the disclosures rightfully left in reviews, “free product in exchange for an honest review” etc… caught really bad press from big media who spread the fire to millions of people including the suits at Amazon. These higher ups at Amazon made the TOS change, and they fired back an answer to media and consumers to save face and regain shopper trust. My point: Amazon does NOT want to see disclosure on their reviews as it’s what caused this chaos. Yes. Shoppers can still leave reviews, however this is strictly optional, it can be positive or negative, and they should not leave disclosure on Amazon because you are not contractually obligated to do so. Any disclosure will be blocked or removed by Amazon. If there is no expectation of a review, then there is no disclosure needed, in our opinion, when reading the FTC’s endorsement guidelines. This does not mean influencers shouldn’t leave a disclosure on social or blog posts. We take FTC guidelines very seriously and are only making this statement for Amazon reviews because they are no longer required on our site. Tomoson absolutely does not require reviews for Amazon products, and it’s up to the seller to provide awesome products and customer service to compel all of its shoppers to leave reviews of their own free will. 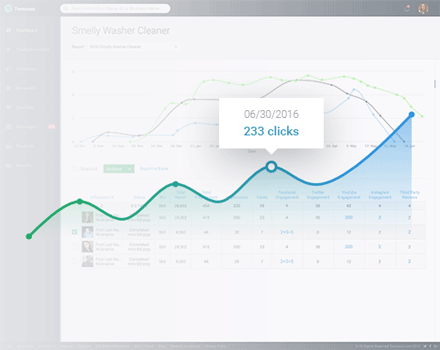 Tomoson wants to help brands increase their sales on Amazon, Etsy, and any other website. 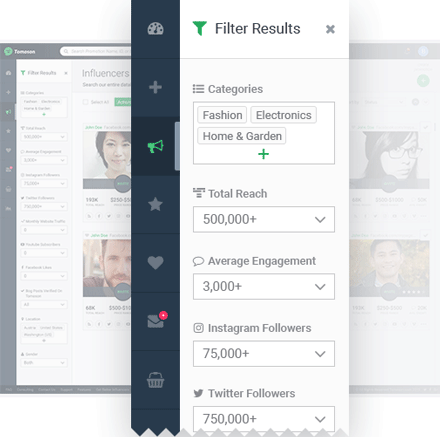 Currently you can do this by running deals, influencer marketing, and working with micro influencers to share social signals to their friends. Deals are great because you can control the amount of inventory you’re selling on a given day. Influencer marketing gives you the opportunity to work with professional influencers who can get the word out about your brand to a large audience. Micro influencers are typically most trusted by their friends and can have some of the largest impact on your brand. Think of micro influencers like a ton of sales reps spreading word of mouth referrals on social media. Each of these tactics needs to be used consistently month after month to have a lasting effect. Doing something one and done will get some results, but everyone knows marketing is a constant thing that needs to be promoted day after day. You can run a deal on Tomoson by selecting increase organic sales or honest star ratings under the marketing goals on the create promotion page. If you’re running a deal for an Amazon product, it’s suggested to use the increase organic sales goal because you can’t require an honest star review on Amazon. If the user leaves the review that is a bonus but it’s not required. If you’re selling on any other platform that still allows honest star reviews please use the Honest Star Rating goal. We DO support all other platforms, so you can leverage Tomoson for any of your other honest star review needs. Remember all users are not required to leave a positive review. They are only required to use the product and speak about their honest opinions, good or bad. 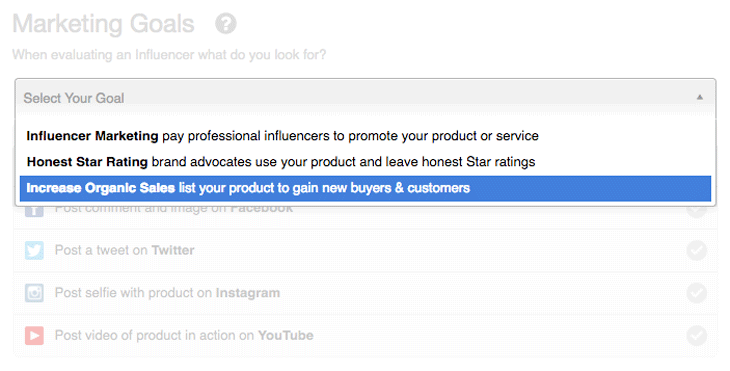 If you’re looking to work with professional influencers make sure to select the influencer marketing goal on the create promotion page. On the other hand micro influencers will apply to any of the marketing goals so any type will do. As you work with these users you will start to generate some amazing content for your brand. Pro Tip: When creating a promotion limit the number of social channels to two of them (Instagram and Youtube for example). The more social channels you select the more barriers to entry you’re creating for users to apply to your campaign. Online, content is key. Giving search engines like Google something to present during searches, increasing your brand awareness, and giving you images to work with. Obviously, this can help you in tons of ways. The best kind of content is user generated. It’s like having someone recommend something to you. Utilizing the right people with the right social platforms can increase your sales exponentially. Tomoson helps facilitate user generated content. User generated content is a powerful tool that every brand can benefit from when that content is being posted on various social media. Here’s an example of a social post on instagram driving a sale. With over 500 million accounts that are active each month, Instagram is a still-growing social media platform that every brand should be utilizing. It is well-known that the online world is a visual one, so it makes sense that a platform devoted to sharing pictures is widely successful. Instagram users are 120 times more likely to engage (like,comment,share) a brand’s post than Twitter users, and 58 times more likely than Facebook users. If you want to see some successful Instagram post examples, check out some of these here, here and here! How many hours are used up on us watching funny cat videos or how to videos on Youtube? If we just consider how much YouTube is used on mobile phones alone, its reach far exceeds any CABLE TV network for people between the ages of 18 and 49. With unboxing videos, tutorials, reviews, and more, YouTube continues to be a platform that can benefit a brand exponentially. Everyone wants to see products in action and there is no better way than a video. Check out an example of a Tomoson influencer’s product review video. We all trust the opinions of our friends more than complete strangers, so it’s not really surprising that Facebook has proven to be a great tool for brands. With the ability to pass along pictures and videos on the platform, content possibilities for Facebook are endless. Using pictures on Facebook increases likes by over half, and comments by over 100%. Click-through rates on posts are increased by 84% when a n image is present. Since the embedded video player was introduced to Facebook you can also make the most out of videos on Facebook. Videos made for Youtube or pictures originally posted on Instagram can be shared on Facebook to widen the audience of content already created. Powerful tools you have access to already are able to have a further reach. Just take a look at how this guy used influencers to start a successful online business with very little financial resources in matter of weeks. And all this while he was running his main business. But what exactly is a micro-influencer? Why are they important? Finding the right micro influencer can sometimes be more helpful than a professional influencer with a huge following. Let us explain. What is a micro influencer? Micro influencers are everyday consumers who have 500 – 5,000 highly engaged followers around relevant topics. Micro-influencers generally have the smallest reach, but they also have the highest engaged reach and are mightier in numbers. They are motivated by “VIP” treatment, such as discounts, exclusive promotions and special offers, instead of cash (source). micro influencers have 22.2 times more conversations per week than the average consumer recommending a brand to other people. Influencer agency Markerly recently conducted a survey of 2 million social media influencers which found that for unpaid posts, Instagram influencers with less than 1,000 followers generally see a like rate of about 8%, whereas those with 1,000 – 10,000 followers have a like rate of 4% percent. Even more interestingly, as the follower base continues to increase, the like rate decreases. On Instagram, Influencers with 10,000 – 100,000 followers see a 2.4% like rate compared to just 1.6% for those who have over 1 million followers. The rate of comments follows a similar pattern. Instagram users with 1,000 followers or fewer managed to get 9.7% engagement on an average. Users with 1,000-4,000 followers managed to get 4.5% engagement on an average. Users with 4,000-100,000 followers managed to get 2.4% engagement on an average. Those with more than 100,000 followers managed to get only 1.7% engagement on an average. On Instagram, 84% of micro-influencers charge less than $250 per branded post. 97 percent of them charge less than $500 for a branded post. Branded blog posts are a slightly different story. 87% of micro-influencers charge less than $500 per post. 96 percent of them charge less than $1000 per post. On Facebook, 90% of micro-influencers charge less than $250 per branded Facebook post. 97 percent charge less than $100 per branded post. Most micro-influencers charge less than $150 per Tweet… 96% charge less than $100. Let’s all work together to turn last week’s chaos into an opportunity to have our cake and get back into rhythm before the holidays. What questions or ideas do you have for us as we move to the future?